mother of the bride dresses for the most special day of your life. A range of fabrics and silhouettes that evoke uniqueness and romance. Check out what's trending now with the hottest colored wedding dresses from Lalamira. Searching for the latest Delicate Strapless A-Line/Princess Wedding Dresses Knee-Length Organza Sleeveless designs? We offers an extensive 2019 new colored wedding dresses collection. Check out the new styles you'll see on every bride in 2019 here.. The dress came perfectly in size and everything. I attached a new train on the long back portion of a skirt but That was my plan when I purchase the dress...you can see on the picture. I always recommend to everyone to buy at Lala Mira but also give them details how the dress is , on size and the way it looks as well. So it wouldn’t have any mistakes. I ordered this dress FIVE days ago. With the expectation it was going to be at least a month before receiving. It showed up at my door step at 9:30pm! It fit so well! Ive never wrote a review in my life! But this is a big moment in my life and I'm happy I made the right decision on where I ordered my dress! And for this price! I have no complaints. Dress was better than expected for the price. Tailored fit was perfect. Delivery was timely. Not sure why this site gets poor reviews unless people have unrealistic ideas for what you can purchase at this price point. I thought quality was excellent for under $200.00! Very happy with my dress and excited to find something so beautiful at this price. Can’t see paying hundreds or thousands of dollars for something I will wear only a few hours of my life. Beautiful dress! It fits my body perfectly according to my provided measurements. I couldn't be happier with the details and overall beauty of the wedding dress. 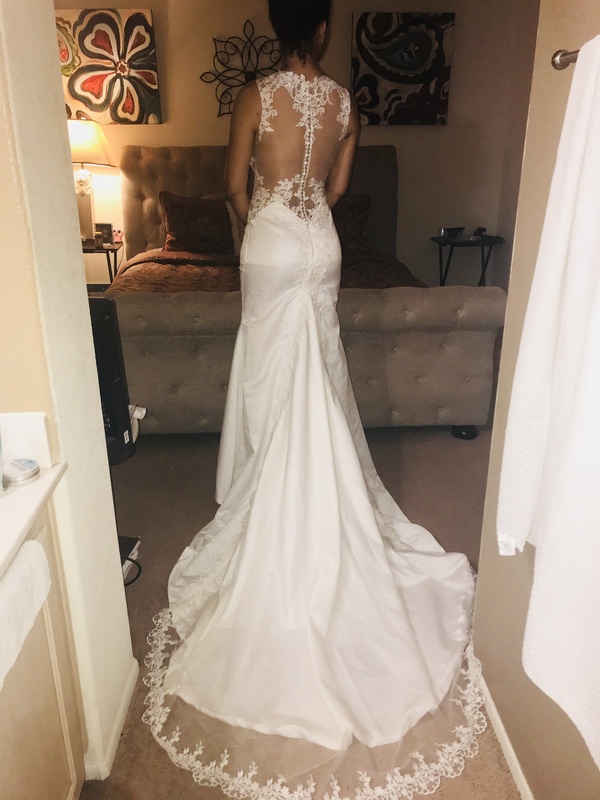 Thank you so much for making my wedding dress everything I wanted it to be!